Residue management and tillage can reduce greenhouse gas emissions from soils during production of corn stover for biofuel. Corn stover trial field. Photo: Virginia L. Jin. Crop residues such as corn stover are on track to make up a large part of our future renewable-energy supply. But removing residues from cropland may increase the risk of soil erosion, compaction, and poorer soil productivity due to lower organic carbon. 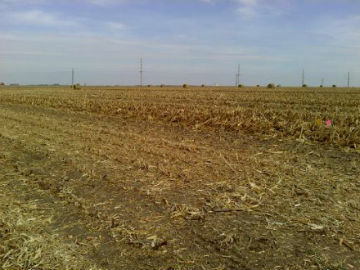 To offset these potential negative effects of crop residue removal, producers can use alternative tillage practices such as reduced tillage or no-till. However, it’s important to take into account how soil greenhouse gas (GHG) emissions are affected by these agronomic management practices used to produce bioenergy feedstocks. How does removing corn stover for bioenergy affect soil GHG emissions? Do different tillage practices in stover production have an impact on GHG emissions? Virginia Jin, research soil scientist, and her associates in the USDA Agricultural Research Service sought answers to these questions in their research on crop production systems in the Corn Belt, an area that is likely to be a major source of crop residues for biofuels. 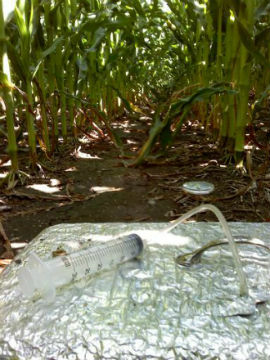 Field trials can help verify models that estimate the effects of corn stover removal and management on soil GHG emissions. But the few previous studies about the effects of tillage practices on GHG have shown widely varying results. 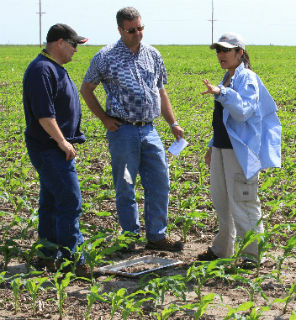 Jin and her associates summarized and analyzed the results from a wide range of field trials at multiple locations during the growing seasons of 2008 through 2012. The trials, which were a part of the USDA’s Resilient Economic Agricultural Practices, measured soil GHG emissions in nine corn production systems located in Indiana, Iowa, Minnesota, Nebraska, and South Dakota. In these trials, varying amounts of corn stover were removed from each of the sites—from no stover removal (e.g., only grain was harvested) to high levels of removal (between 40 and 75% of the stover removed). Then researchers collected soil GHGs every one to two weeks during the growing season using static vented chambers, and measured those samples using gas chromatography. Static chamber used in research. Photo: Virginia L. Jin. In the study, soil GHG emissions varied widely across the production sites, highlighting the importance of management and environmental conditions at specific sites. Carbon dioxide (CO2) was by far the largest contributor to soil GHGs from the sites; nitrous oxide (N2O) made a much smaller contribution. Management practices had no effect on levels of methane (CH4), another important GHG of concern. Despite the wide variations in soil GHG emissions by management and year, Jin and her associates found that, in general, the removal of corn stover resulted in lower GHG emissions. Taking more stover reduced the amount of carbon and nitrogen inputs that went into the soil, and therefore lowered soil GHG production. Stover removal may also have affected the microclimate of specific sites by changing soil cover. Under conventional tillage using a disk, chisel, or moldboard plow, soil emissions of CO2 increased while N2O decreased slightly, compared to reduced-tillage or no-till. Weather also played an important role on soil GHG emissions. More precipitation resulted in higher GHG emissions in this study. Interestingly, extreme drought conditions also led to higher soil GHG emissions, especially in conventionally tilled soils even after stover was removed. The study showed that employing conservation tillage when corn stover is removed could help prevent soil erosion and also provide a climate-adaptive management strategy that helps reduce soil GHG emissions. With an increasing emphasis on agriculture to contain or reduce its GHG emissions, a renewable-biomass industry will have to optimize biomass production practices with associated GHG impacts if it is going to be sustainable in the future. Agricultural management practices for crop production can promote carbon sequestration in soils and biomass, and therefore are an important strategy in that effort. As the use of crop residues such as corn stover for renewable energy grows, producers must be aware of how their management affects soil GHG emissions. For instance, the removal rate of corn stover influences how much GHG is emitted by the soil. But it isn’t straightforward: removal rates also impact the risk of increased soil erosion or decreased soil productivity. By paying attention to tillage practices and to the amount of stover removed from cornfields during harvest, growers can reduce the amount of GHG emissions while effectively managing for optimal production. Researchers Bryan Woodbury, ag engineer, Dan Miller, microbiologist, and Virginia Jin, soil scientist, USDA-ARS. Photo: Richard Ferguson, U. of Nebraska-Lincoln. Soil Greenhouse Gas Emissions in Response to Corn Stover Removal and Tillage Management Across the U.S. Corn Belt, Virginia Jin, et. al., Bioenergy Research, DOI: 10.1007/s12155-014-9421-0, February 2014. Crop residue mass needed to maintain soil organic carbon levels: Can it be determined? Jane M. F. Johnson et al., BioEnergy Research, DOI: 10.1007/s12155-013-9402-8, February 2014. Energy Potential and Greenhouse Gas Emissions from Bioenergy Cropping Systems on Marginally Productive Cropland, Marty R. Schmer, et al., PLoS ONE 9(3): e89501, March 2014.